After a very intense month, around 3:45 pm EST today, I validated this crazy master document with the text of two novels I’ve been slaving away at the past few weeks. Project A: The Graced, clocked in at about 51,517 words. Project B: The Dream Maker, features a total of about 50,833 words. My back hurts, my wrists are sore, and there are dirty dishes still in the sink, but I am done. It’s so incredibly exhilarating to be finished with these two manuscripts that have been on my heart for years. The hard work is done, and yet it is not. For in the coming months, I will need to revise, edit, rewrite and rinse and repeat to have publishable work. But for now, I am content to get back to my regularly scheduled life. Advent is here, and I have several five-gallon bins of decorations to put out, a book full of cookie recipes to try, and a list more than a dozen people long to shop for. If anyone out there wonders why someone would do something like this to themselves, or is afraid that life gets in the way, I think my experience shows that it can be done. It’s not just life that happens when you’re writing, but that writing should be happening in your life. And it is possible. You can do it. I believe in you. Hello, there! 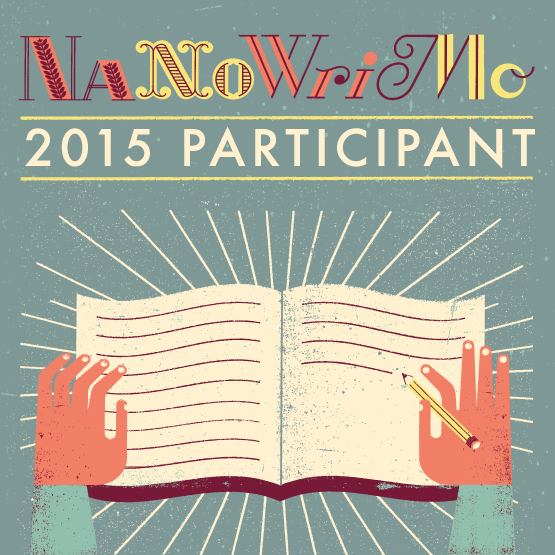 I’m poking my head up from a NaNoWriMo binge to let you know about another great giveaway! Author Gina Marinello-Sweeney is giving away a copy of her book, I Thirst. From Amazon: When Rebecca receives a mysterious note from an unknown source, she has no idea how it will change her life. Twenty-year-old Rebecca Veritas is used to being different, but has never felt extraordinary. She is a Dreamer, living in a world of poetry intermixed with the antics of her unique family and eccentric best friend Adriana. When she meets Peter, a young student from Canada who seems somehow to understand her from the start, her perception changes. With “Intermission”, the single word in that mysterious note, as inspiration, the two writers embark on an incredible journey to a new world in the form of a story that will ultimately parallel their own lives. Yet, as the story progresses, events remain ever more shrouded in mystery. When unexpected circumstances in the real world throw their lives in disarray, it will be up to Rebecca to find the true meaning of “Intermission” before the curtain closes on the final act. I THIRST received the 2013 YATR Literary Award for Best Prologue. Hello! We writers have to stick together, which is why I’m so happy to support fellow authors. Please check out Cynthia T. Toney’s Goodreads Giveaway for her novel 10 Steps to Girlfriend Status. From Goodreads: “A Cajun family secret, two very different boys, and a fight to keep a grandmother’s love—who would’ve guessed that looking through old photo albums could get Wendy into so much trouble? Wendy Robichaud is on schedule to have everything she wants at the start of high school: two loyal best friends, a complete and happy family, and a hunky boyfriend she’s had a crush on since eighth grade—until she and Mrs. Villaturo look at old photo albums together. That’s when Mrs. V sees her dead husband and hints at a 1960s family scandal down in Cajun country. Faster than you can say “crawdad,” Wendy digs into the scandal and into trouble. She risks losing boyfriend David by befriending Mrs. V’s hearing-impaired grandson, alienates stepsister Alice by having a boyfriend in the first place, and upsets her friend Gayle without knowing why. Will Wendy be able to prevent Mrs. V from being taken thousands of miles away? And will she lose all the friends she’s fought so hard to gain? This story uses humor and hope to address issues of adapting to a blended family, having a loved one suffering from Alzheimer’s, and struggling through that first innocent romantic relationship.” This book is the second in the Bird Face series. Hello! My blogging is taking a backseat right now thanks to National Novel Writing Month. Anyone else participating? I have a very ambitious goal this year: two 50,000-word novels by November 30. It means writing an average of 3,333 words per day. I’m alternating between projects day-by-day. So far, it’s keeping the voices clearer and giving me time to think ahead to where I need to go next. That’s the difficulty of my process: I do some light planning, knowing which beats I have to hit, and then when I get into drafting, I power through until I’ve exhausted the scene/chapter/phase and have no idea how to go forward. I hope to have some more good news in the coming month, as well as a go-ahead from my editor to work on some new manuscripts. But they can wait until December!